Dr Manmohan Singh has spoken of how pleasantly surprised he was to be made Finance Minister in July 1991 by PV Narasimha Rao. Dr Singh was an academic before becoming a government economic official in the late 1960s, rising to the high office of Reserve Bank Governor in the 1980s. Mr Montek Singh Ahluwalia now refers to him as “my boss” and had been his Finance Secretary earlier. Mr Ahluwalia was a notable official in the MacNamara World Bank before being inducted a senior government official in 1984. Mr P Chidambaram was PVNR’s Commerce Minister, and later became Finance Minister in the Deve Gowda and Gujral Governments. Mr Chidamabaram is a Supreme Court advocate with an MBA from Harvard’s Business School. During 1998-2004, Dr Singh and Mr Chidambaram were in Opposition but Mr Ahluwalia was Member-Secretary of the Vajpayee Planning Commission. Since coming together again in Sonia Gandhi’s United Progressive Alliance, they have been flatteringly named the “Dream Team” by India’s pink business newspapers, a term originally referring to some top American basketball players. Based on pronouncements, publications and positions held, other members or associates of the “Dream Team” include Reserve Bank Governor Dr YV Reddy; his predecessor Dr Bimal Jalan; former PMO official Mr NK Singh, IAS; Chief Economic Advisers Dr Shankar Acharya and Dr Ashok Lahiri; RBI Deputy Governor Dr Rakesh Mohan; and others like Dr Arvind Virmani, Dr Isher Ahluwalia, Dr Parthasarathi Shome, Dr Vijay Khelkar, Dr Ashok Desai, Dr Suman Bery, Dr Surjit Bhalla, Dr Amaresh Bagchi, Dr Govind Rao. Honorary members include Mr Jaswant Singh, Mr Yashwant Sinha, Mr KC Pant and Dr Arun Shourie, all economic ministers during the Vajpayee premiership. Institutional members include industry chambers like CII and FICCI representing “Big Business”, and unionised “Big Labour” represented by the CPI, CPI(M) and prominent academics of JNU. Mr Mani Shankar Aiyar joins the Dream Team with his opinion that a gas pipeline is “necessary for the eradication of poverty in India”. Mr Jairam Ramesh explicitly claimed authoring the 1991 reform with Mr Pranab Mukherjee and both must be members (indeed the latter as Finance Minister once had been Dr Singh’s boss). Dr Arjun Sengupta has claimed Indira Gandhi started the reforms, and he may be a member too. External members include Dr Jagdish Bhagwati, Dr. TN Srinivasan, Dr Meghnad Desai, Dr Vijay Joshi, Mr Ian Little, Dr Anne O. Krueger, Dr John Williamson, IMF Head Dr R Rato, and many foreign bank analysts who deal in Bombay’s markets. Harvard’s Dr Larry Summers joins with his statement while US Treasury Secretary in January 2000 that a 10% economic growth rate for India was feasible. His Harvard colleague Dr Amartya Sen — through disciples like Dr Jean Dreze (adviser to Sonia Gandhi on rural employment) — must be an ex officio member; as an old friend, the Prime Minister launched Dr Sen’s recent book while the latter has marked Dr Singh at 80% as PM. Media associates of the Dream Team include editors like Mr Aroon Purie, Mr Vinod Mehta, Dr Prannoy Roy, Mr TN Ninan, Mr Vir Sanghvi and Mr Shekhar Gupta, as well as the giddy young anchors of what passes for news and financial analysis on cable TV. C: “The Dream Team averted a macroeconomic crisis through “structural adjustment” carried out with help of the IMF and World Bank; hence too, India was unaffected by the 1997 ‘Asian crisis'”. Overall, the New Delhi Consensus paints a picture of India’s economy on an immensely productive trajectory as led by Government partnered by Big Business and Big Labour, with the English-speaking intellectuals of the Dream Team in the vanguard as they fly between exotic conferences and international commercial deals. An endless flow of foreign businessmen and politicians streaming through Bangalore, Hyderabad, five-star hotels or photo-opportunities with the PM, followed by official visits abroad to sign big-ticket purchases like arms or aircraft, reinforce an impression that all is fine economically, and modern India is on the move. Previously rare foreign products have become commonplace in India’s markets, streets and television-channels, and a new materialist spirit, supposedly of capitalism, is captured by the smug slogan yeh dil mange more (this heart craves more) as well as the more plaintive cry pardesi jana nahin, mujhe chhorke (foreigner, please don’t leave me). 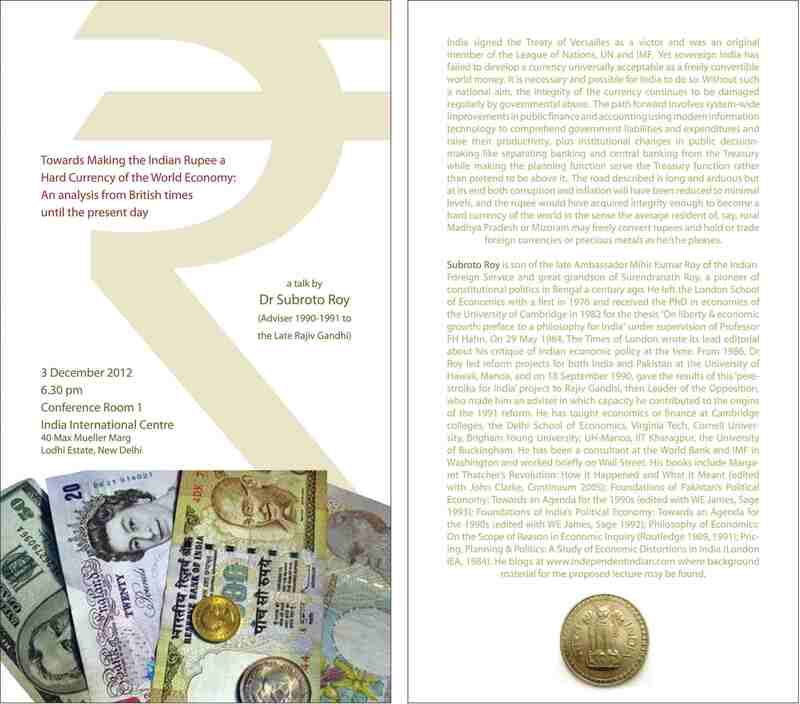 India’s Rupee became inconvertible in 1942 when the British imposed exchange controls over the Sterling-Area. After 1947 independent India and Pakistan, in name of “planned” economic development, greatly widened this war-time regime – despite the fact they were at war now only with one another over Jammu & Kashmir and, oddly enough, formed an economic union until 1951 with their currencies remaining freely convertible with each other. 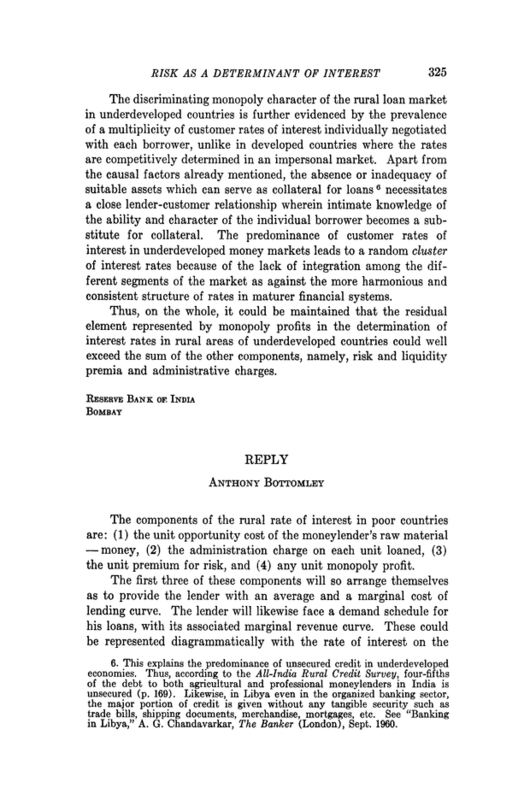 On May 29 1984, the present author’s Pricing, Planning and Politics: A Study of Economic Distortions in India proposed in London that the Indian Rupee become a convertible hard currency again — the first time liberal economics had been suggested for India since BR Shenoy’s critique of the Second Five Year Plan (a fact attracting an editorial of The Times). The simple litmus test whether believers in the New Delhi Consensus have or have not the courage of their stated convictions – i.e., whether what they have been saying is, in its empirical fundamentals, more signal or noise, more reality or rhetorical propaganda – would be to carry through that proposal made 21 years ago. The Dream Team have had more than enough political power to undertake this, and it remains the one measure necessary for them to demonstrate to India’s people and the world that the exuberant confidence they have been promoting in their model of India’s economy and its prospects is not spurious. What does convertibility entail? For a decade now, India has had limited ease of availability of foreign exchange for traders, students and tourists. Indeed some senior Government monetary economists believe there is convertibility already except forex dealers are being allowed “one-way” and not “two-way” quotes! That is wrong. The Government since 1942 has requisitioned at the border all foreign exchange earned by exporters or received as loans or investment — allocating these first to pay interest and amortisation on the country’s foreign debt, then to make its own weapons and other purchases abroad, then to release by ration what remains to private traders, students, tourists et al. Current account liberalisation has meant the last of these categories has been relaxed, especially by removal of some import quotas. What a convertible Rupee would mean is far more profound. It would allow any citizen to hold and save an Indian money that was exchangeable freely (i.e. without Government hindrance) into moneys of other countries. Full convertibility would mean all the paper money, bank deposits and rupee-denominated nominal assets held by ordinary people in India becomes, overnight, exchangeable without hindrance into dollars, yens, pounds or euros held anywhere (although not of course at the “one-way” rates quoted today). Now money is a most peculiar human institution. Paper money is intrinsically worthless but all of India’s 1,000 million people (from street children onwards) have need to hold it temporarily to expedite their individual transactions of buying and selling real goods and services. Money also acts as a repository of value over time and unit of account or measure of economic value. While demand to hold such intrinsically worthless paper is universal, its supply is a Government monopoly. Because Government accepts obligations owed to it in terms of the fiat money it has itself issued, the otherwise worthless paper comes to possess value in exchange. Because Government controls its supply, money also can be abused easily enough as a technique of invisible taxation via inflation. With convertibility in India, the quantity of currency and other paper assets like public debt instruments representing fiscal decisions of India’s Union and State Governments, will have to start to compete with those produced by other governments. Just as India’s long-jumpers and tennis-players must compete with the world’s best if they are to establish and sustain their athletic reputations, so India’s fiscal and monetary decisions (i.e. about government spending and revenues, interest-rates and money supply growth) will have to start competing in the world’s financial markets with those of the EU, USA, Japan, Switzerland, ASEAN etc. The average family in rural Madhya Pradesh who may wish, for whatever personal reason, to liquidate rupee-denominated assets and buy instead Canadian, Swiss or Japanese Government debt, or mutual fund shares in New York, Frankfurt or Singapore, would not be hindered by India’s Government from doing so. They would become as free as the swankiest NRI jet-setters have been for years (like many members of the New Delhi Consensus and their grown children abroad). Scores of millions of ordinary Indians unconnected with Big Business or Big Labour, neither among the 18 million people in government nor the 12 million in the organised private sector, would become free to hold any portfolio of assets they chose in global markets (small as any given individual portfolio may be in value). Like all those glamorous NRIs, every Indian would be able to hold dollar or Swiss Franc deposit accounts at the local neighbourhood bank. Hawala operators worldwide would become redundant. Ordinary citizens could choose to hold foreign shares, real-estate or travellers’ cheques as assets just as they now choose jewellery before a wedding. The Indian Rupee, after more than 65 years, would once again become as good as all the proverbial gold in Fort Knox. When added up, the new demand of India’s anonymous masses to hold foreign rather than Rupee-denominated assets will certainly make the Rupee decline in price in world markets. But — if the implicit model of India’s economy promoted by the Dream Team is based on correctly ascertained empirical facts — foreign and domestic investor confidence should suffice for countervailing tendencies to keep India’s financial and banking system stable under convertibility. Not only would India’s people be able to use and save a currency of integrity, the allocation of real resources would also improve in efficiency as distortions would be reduced in the signalling function of domestic relative prices compared to world relative prices. An honest Rupee freely priced in world markets at, say, 90 per dollar, would cause very different real microeconomic decisions of Government and private producers and consumers (e.g., with respect to weapons’ purchases or domestic transportation, given petroleum and jet fuel imports) than a semi-artificial Rupee at 45 per dollar which forcibly an inconvertible asset in global markets. A fully convertible Rupee will cause economic and political decisions in the country more consistent with word realities. Now Rajiv Gandhi was an airline-pilot and knew no economics. But the origins of the 1991 reform did come about because of an encounter he had, as Opposition Leader and Congress President from September 1990 onwards, with a “perestroika” project for India’s political economy occurring at an American university since 1986 (viz., The Statesman Editorial Page July 31-August 2 1991, now republished here; Freedom First October 2001). In being less than candid in acknowledging the origins of the reform, the Dream Team may have failed to describe accurately the main symptoms of illness that afflicted India before 1991, and have consequently failed to diagnose and prescribe for it correctly ever since. The Government of India, like many others, has been sorely tempted to finance its extravagant expenditures by abusing its monopoly over paper-money creation. The British taught us how to do this, and in 1941-43 caused the highest inflation rates ever seen in India as a result. Fig. 1 shows this, and also that real growth in India follows as expected the trend-rate of technological progress (having little to do with government policy). Independent India has continually financed budget- deficits by money creation in a process similar to what the British and Americans did in wartime. This became most conspicuous after Indira Gandhi’s bank and insurance nationalisations of 1969-1970. Indeed, among current policy-makers, Pranab Mukherjee, Manmohan Singh, Arjun Sengupta, Montek Singh Ahluwalia, Bimal Jalan, NK Singh, Amaresh Bagchi and Shankar Acharya, were among those governing such macroeconomic processes before 1991 — albeit in absence of the equations that illustrate their nature. Why the Rupee cannot be made an honest, internationally convertible, stable money held with confidence by all Indians today, is because the Dream Team have continued with the same macroeconomics ever since. The personal and political ambitions of the tiniest super-elite that the New Delhi Consensus represent (both personal and political) have depended precisely on gargantuan unending deficit-financing backed by unlimited printing of paper-money, and hence the continuing destruction of the integrity of India’s banking system. A convertible Rupee would allow India’s ordinary people to choose to hold other stores of value available in the world today, like gold or monies issued by foreign governments, and thus force an end to such processes. Two recent articles in The Statesman (Perspective Page 30 October 2005, Front Page 29 November 2005) outlined India’s financial repression and negative real interest rates (which suffice to explain the present stock market boom the way athletes perform better on steroids), and also how deficits get financed by money creation accompanied by wishful projections of economic growth in an upside down imitation of how macroeconomic policy gets done in the West. “Narrow Money” consists mostly of hand-to-hand currency. “Broad Money” consists of Narrow Money plus bank-deposits. 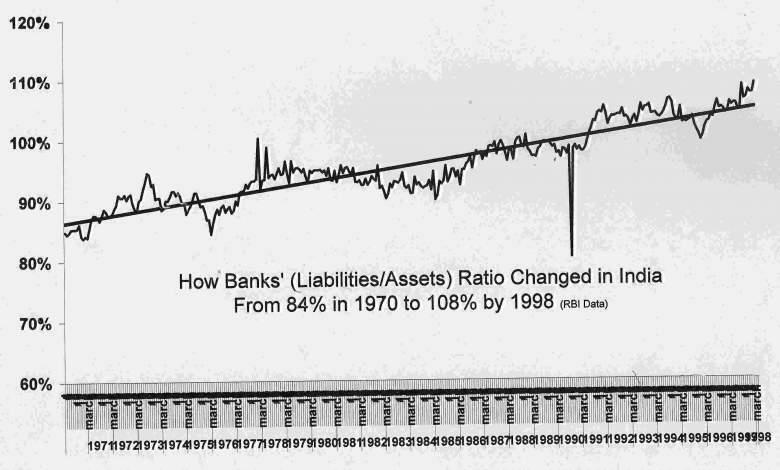 Modern banking is built on “fractional reserves”, i.e. a system of trust where your bank does not literally hold onto deposits you place there but lends these out again – which causes further deposit expansion because no individual banker can tell whether a new deposit received by it is being caused by the depositor having himself borrowed. As a general rule, bank lending causes further deposit expansion. Why India’s (and China’s) bank deposits have been expanding is not because Indians (or Chinese) are superhuman savers of financial assets in banks but because the Government of India (and China) has for decades compelled (the mostly nationalised) banks to hold vast sums of Government debt on the asset side of their balance-sheets. Thus there has been humongous lending by the banking system to pay for Government expenditures. The Dream Team’s macroeconomics relies entirely on this kind of unending recourse to deficit finance and money creation, causing dry rot to set into banks’ balance sheets (Figs. 2,3, 4). If the Rupee became convertible, those vast holdings of Government debt by banks would become valued at world prices. The crucial question would be how heavily New York, London and Hong Kong financial markets discounted Indian sovereign debt. If upon convertibility, the asset sides of domestic Indian banks get discounted very heavily by world financial markets, their insolvency upon being valued at international prices could trigger catastrophic repercussions throughout India’s economy. Hence the Rupee cannot be made convertible — and all our present inefficiencies and inequities will continue for ever with New Delhi’s rhetorical propaganda alongside. The capital flight of 10 out of 1000 million Indians will continue, leaving everyone else with the internal and foreign public debts to pay. Had Rajiv Gandhi not been assassinated and the perestroika project allowed to take its course, a different strategy would have been chosen. Honest money first demands honest Government and political leadership. It would at the outset have been recognised by Government (and through Government by all India’s people) that the asset-liability, income-expenditure and cash-flow positions of every public entity in the country without exception — of the Union Government, every State and local Government, every public undertaking and project – is abysmal. Due to entanglement with government financial loans, labour regulations, subsidies, price controls, protection and favouritism, the same holds for the financial positions of vast numbers of firms in the organised private sector. Superimpose on this dismal scene, the bleak situation of the Rule of Law in the country today – where Courts of Justice from highest to lowest suffer terrible abuse receiving pitiable amounts of public resources despite constituting a third and independent branch of India’s Government (while police forces, despite massive expenditure, remain incompetent, high-handed and brutal). What India has needed ever since 1991 is the Rule of Law, total transparency of public information, and the fiercest enforcement of rigorous accounting and audit standards in every government entity and public institution. It is only when budgets and financial positions become sound that ambitious goals can be achieved. The Dream Team have instead made a fetish of physical construction of “infrastructure”, in some grandiose make-believe dreamworld which says the people of India wish the country to be a superpower. The Dream Team have failed to properly redefine for India’s masses the appropriate fiscal and monetary relationship between State and citizen – i.e. to demarcate public from private domains, and so enhance citizens’ sense of individual responsibility for their own futures, as well as explain and define what government and public institutions can and cannot do to help people’s lives. Grotesque corruption and inefficiency have thus continued to corrode practically all organs, institutions and undertakings of government. Corruption is the transmutation of publicly owned things into private property, while its mirror image, pollution, is the disposal of private wastes into the public domain. Both become vastly more prevalent where property rights between private and public domains remain ill demarcated. What belongs to the individual citizen and what to sovereign India –their rights and obligations to one another – remains fuzzy. Hence corruption and pollution run amuck. The irrational obsession with “infrastructure” is based on bad economics, and has led to profoundly wrong political and financial directions. The Rupee cannot be made an honest stable money because India’s fiscal and monetary situation remains not merely out of control but beyond New Delhi’s proper comprehension and grasp. If and when the Dream Team choose to wake up to India’s macroeconomic realities, a great deal of serious work will need to be done.